My Instant Pot obsession continues guys…. I honestly don’t know how I ever lived without it. 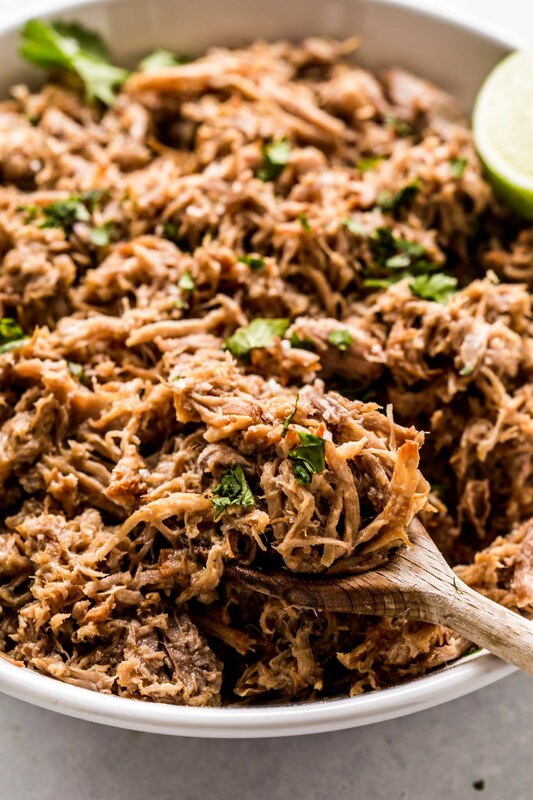 For years I’ve been making this cuban mojo pork, but it has never come out so flavorful, tender and juicy until I made it in my pressure cooker. Not to mention, it cooks in a quarter of the time. Then, add that yummy marinade to a large ziploc bag and pop in your quartered pork shoulder. Let it sit at room temp for an hour, or leave it in the fridge overnight to really let those flavors soak in. When you’re ready to cook, Just throw the entire contents of the bag into your Instant Pot, set it to seal, and let it cook away for 80 minutes. Cut your pork shoulder into four pieces. Not only will it cook faster this way, but also there will be more surface area for all that yummy marinade to soak into. Be sure to give it time to marinate before cooking. I’ll either give it an hour at room temperature, or better yet, leave it to marinate overnight in the fridge. 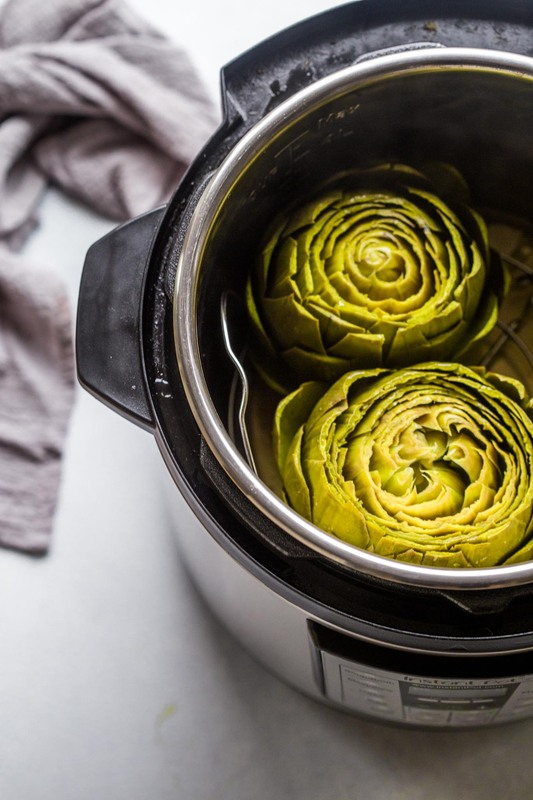 Reduce the cooking liquids – After the pork is done, remove it and then cook those liquids down by using the “saute” feature on the Instant Pot. This really concentrates the flavor and is so delicious when it’s tossed with the shredded pork. Season one last time – Give it a final taste and sprinkle with more salt if necessary. 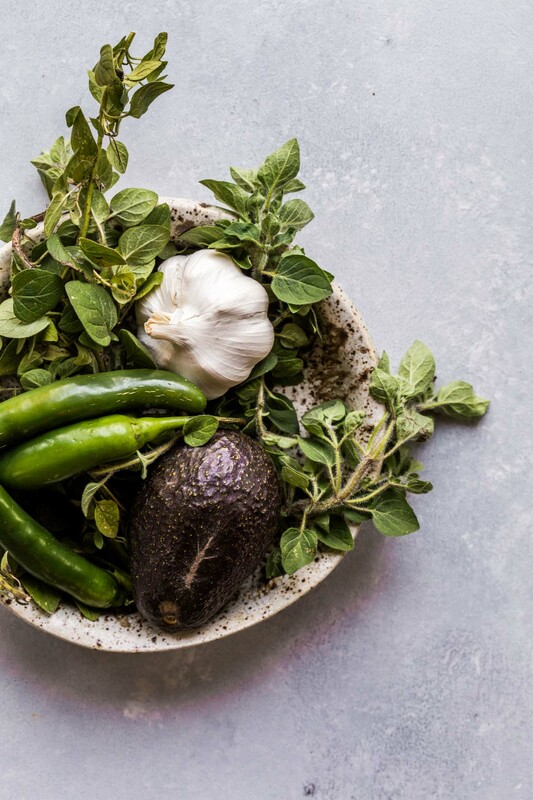 Since the Instant Pot makes things totally hands-off, you’ve got plenty of time to sneak in an episode of Real Housewives and still have time to warm those tortillas and chop up any toppings you might want to pile on top. Might as well go ahead and pop open a bottle of wine while you’re at it too, no? 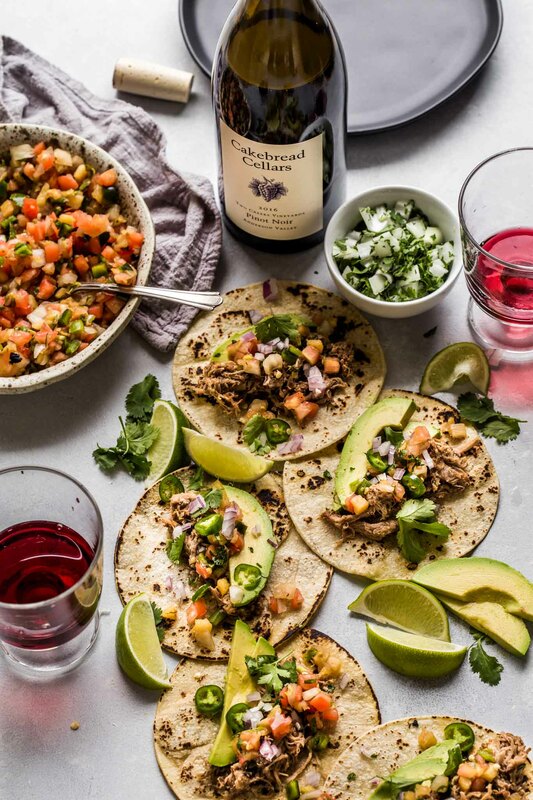 I chose a Cakebread Pinot Noir to go along with this Instant Pot Cuban Mojo Pork.Cakebread Cellars is one of the most esteemed and successful wineries in California’s famed Napa Valley. 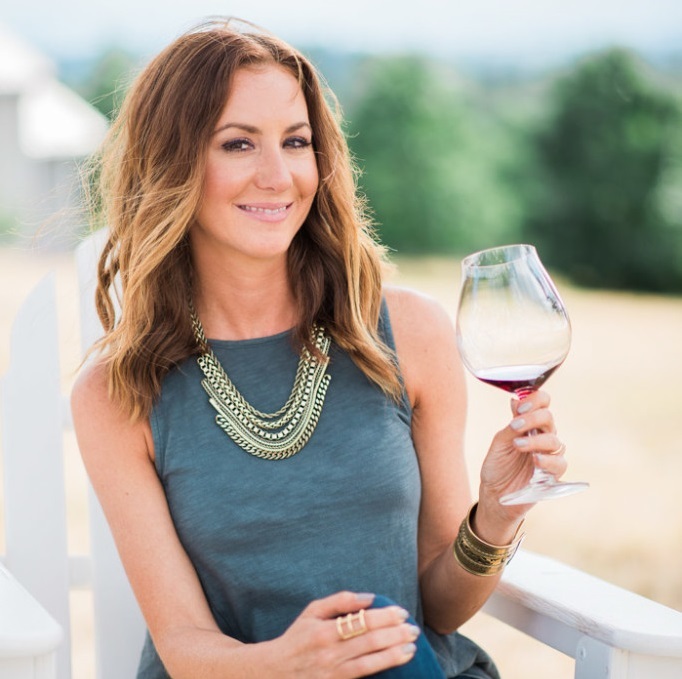 And, since its founding in 1973, the winery has earned a reputation for world-class wines and gracious hospitality. 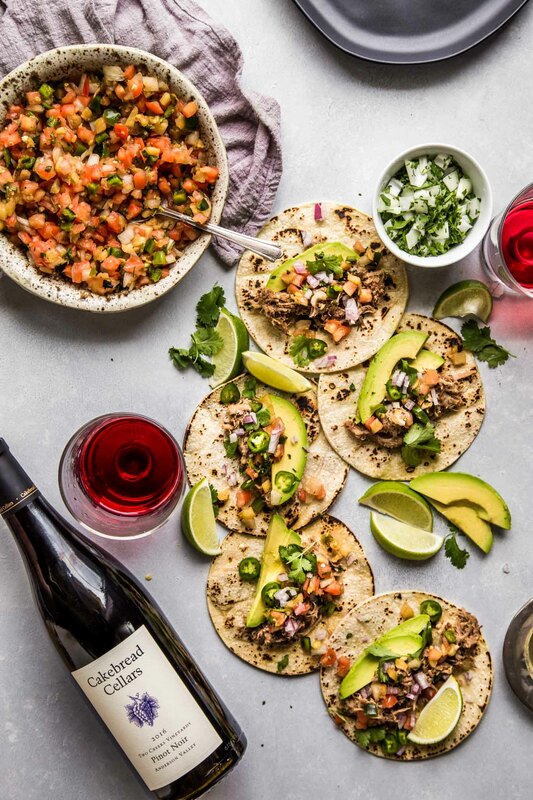 The Pinot’s light body, bright acidity, and notes of tart red berries made the perfect match for the warm spices and notes of citrus in the mojo pork. 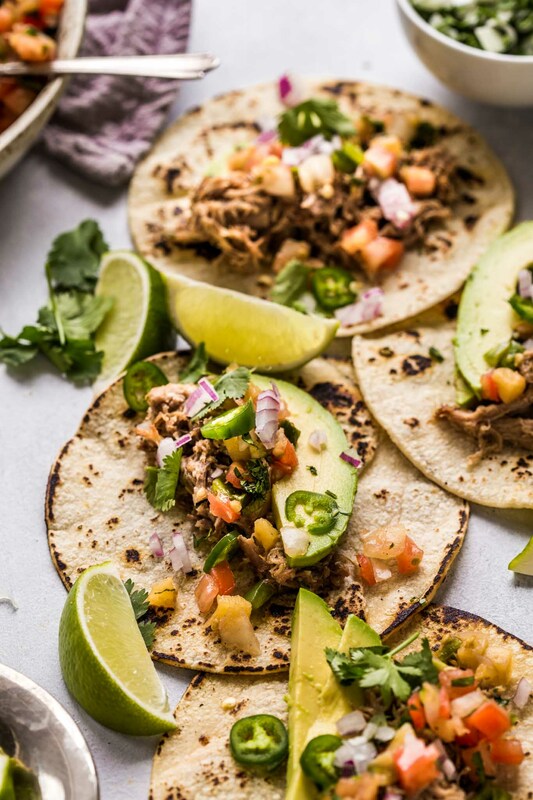 You can eat this Instant Pot Cuban Mojo Pork taco-style, with your favorite toppings, or try serving it up with some rice and black beans on the side, if you’re going the low carb route, you could even serve it with cauliflower rice. Or, make an amazing taco salad with all the fixings. We had plenty leftover since it was just the two of us, so we had tacos one night, bowls the next and with the rest of the mojo pork, we made cubano sandwiches. You can also freeze any leftovers for up to three months. Have you had mojo pork before? How do you like to enjoy yours? I’d love to hear in the comments below. In a blender or mini food processor, combine the garlic, grapefruit juice, lime zest and juice, oil, brown sugar, oregano, cumin, and salt; process until blended. Add this mixture to a ziplock bag, along with the bay leaf and pork. Let sit at room temperature 1 hour, or refrigerated as long as overnight. 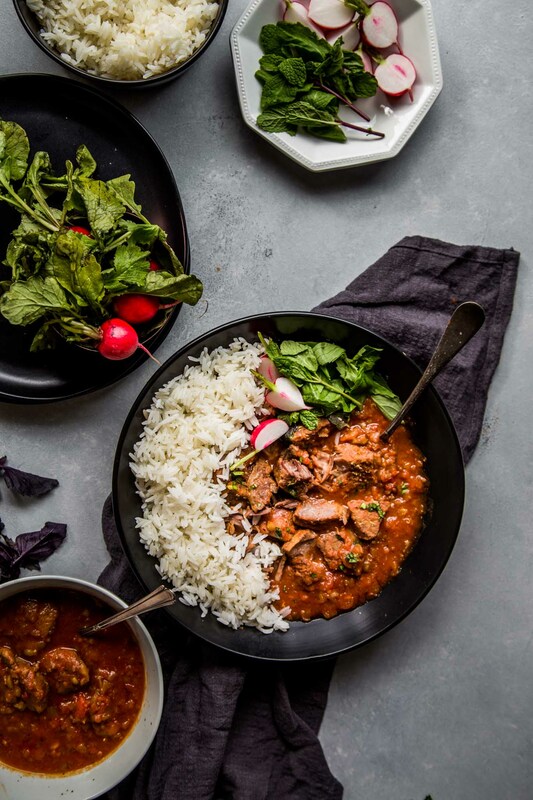 When ready to cook, place the pork and marinade in the Instant Pot. Make sure your sealing ring is in place on the lid. Lock the lid onto the Instant Pot and make sure the steam release knob is in the “sealing” position. Press the “MANUAL” button and set Instant Pot for HIGH pressure for 80 minutes. It will take about 10 minutes for Instant Pot to come to full pressure, then the display will show a countdown timer. Once the 80 minutes are up, allow the pressure to release naturally. Open the lid. Remove the pork from the Instant Pot, leaving the cooking liquids in the pot. Press the “SAUTE” button and boil the cooking liquids for 5 minutes to reduce them a bit. Skim off any extra fat. Toss the shredded pork with about 1 cup of the cooking liquids. Season with salt, to taste. 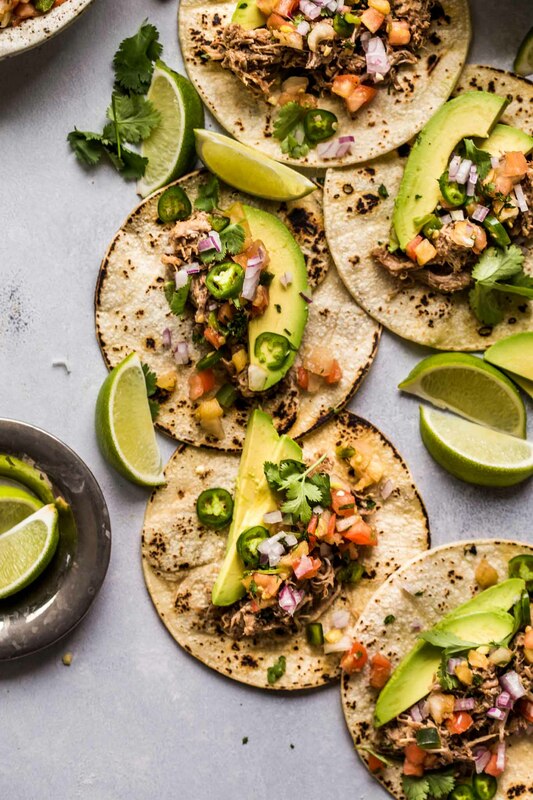 Serve in tortillas with cilantro, avocado, hot sauce, salsa and lime. Place pork in slow cooker and cook on low for 8 hours. 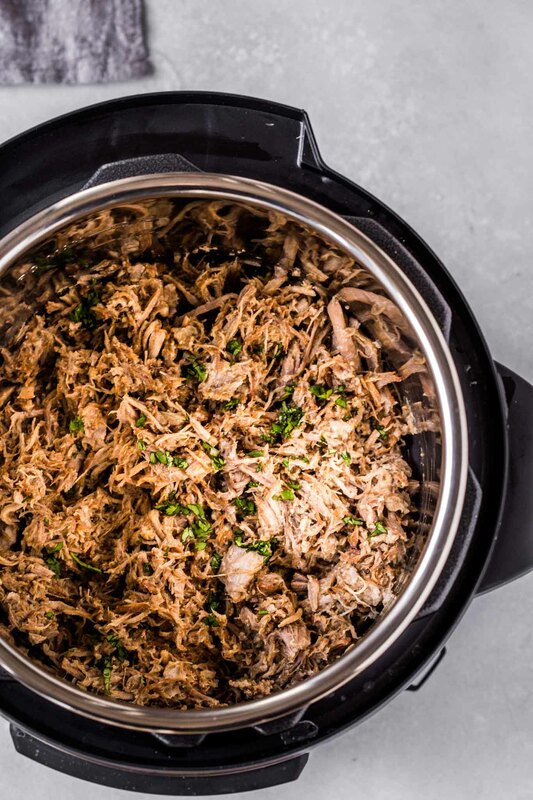 Once the cooking time is up, remove the pork from the slow cooker. Taste the cooking liquids for flavor. If bland, or watery, transfer to a pot on your stove, set over medium-high heat, and boil it down for 7-10 minutes. Season with salt, to taste. Toss the shredded pork with about 1 cup of the cooking liquids. 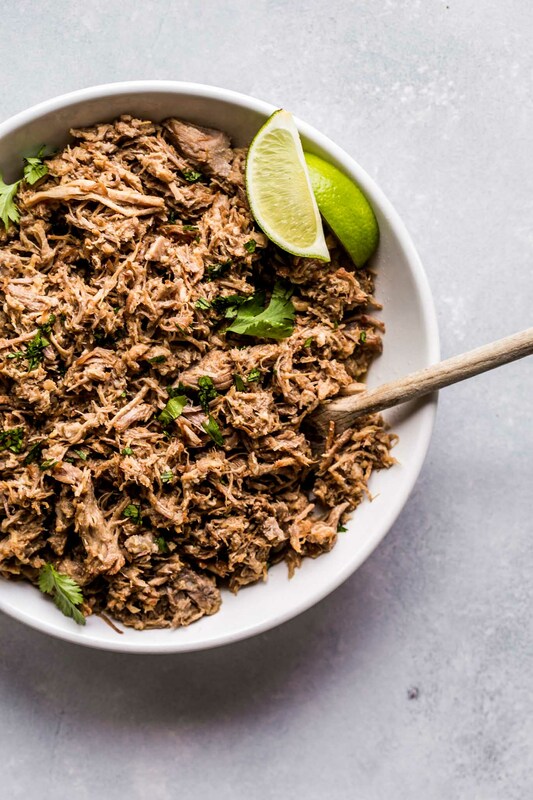 If you loved this Instant Pot Cuban Mojo Pork I would appreciate it so much if you would give this recipe a star review! Also, be sure to snap a picture of your finished dish and share it with me on Instagram using the hashtag #platingsandpairings and tagging me @platingsandpairings. This post was sponsored by Cakebread Cellars. All opinions stated are my own. You’re one of the bloggers that has convinced me I need an InstaPot. I’m asking for one for my birthday! Yay!!! You’re going to love it Catherine! Ooohhh – Yes! The marinade would be great with the pork being smoked too I’m sure! Yum! Hi Hillary – YES! Pressure cooker is the same thing. You’re going to love it! Belated congrats on the wedding too! this pork dish sounds soooo yummy! 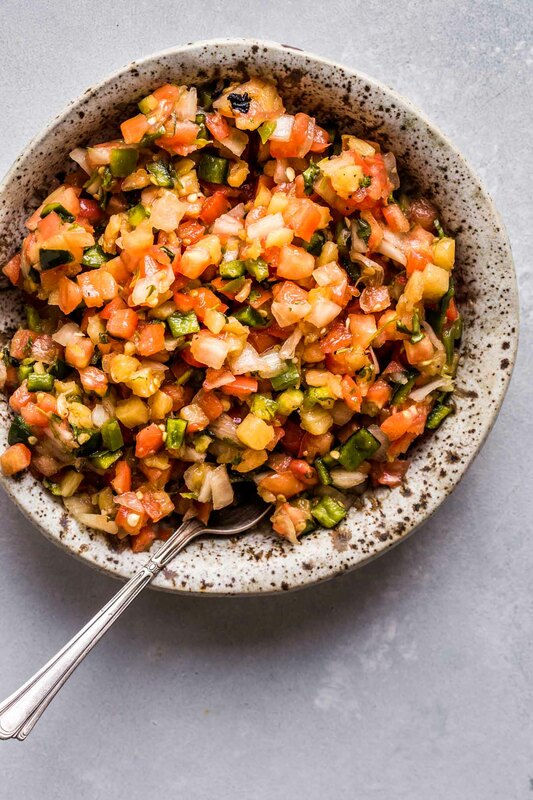 I love the salsa that you served with this, too! Thanks Marlynn! The pork really did come out so flavorful! Just made this today. It’s great and incredibly easy. We served it with dry fried corn tortillas, homemade Pico de gallo, sliced avocado, cilantro, lime wedges, and mojitos. It will definitely be put in our dinner rotation. I had to sub out the grapefruit due to statin issues and used some very grapefruity Sauvignon Blanc in its place. Wish I could use grapefruit, but the flavor was still amazing. Thanks for the recipe! So happy to hear that you liked it Gary – I’m loving you substitution of wine in there! 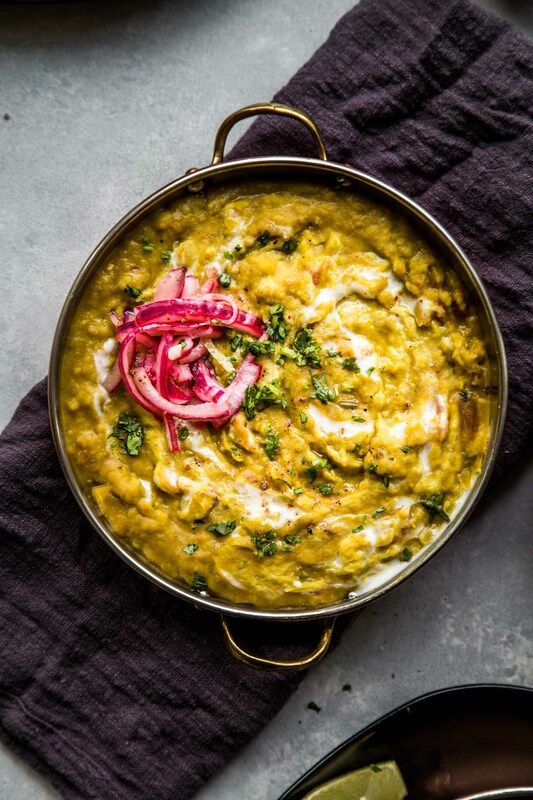 hi gary, i know its been a few months since you commented on this recipe but mojo is usually made with a combination of orange and lime, so those would also be a good substitute for the grapefruit in this recipe! Hi. I am making this tonight. I have cooked a few things in the IP successfully but still getting use to it. I have a question regarding step #6 and natural release. When the 70 minute cook time is finished do I just let the IP sit till pin goes down? I have used quick release before however when leaving it to what seems natural release I don’t see or hear any steam coming out. Any tips for me? Hi Toni – Yep! Just wait for that pin to drop, then you’re good to go! I hope you enjoy dinner tonight!!! Hey, I have my pork marinating as we speak. I don’t see any instruction to add more water to the Instapot when cooking. I don’t think i got a cups worth of grapefruit and lime juice. Do I need to add water before cooking or no? I’m excited to have this dish for dinner tonight, just want to make sure it can come to pressure with just marinade. Thank you! Hi Brittney – You do not need to add any water to the Instant Pot. The citrus juices in the marinade allow it to come to pressure. Hope that helps! I didn’t notice most of the reviewers hadn’t made the recipe until afterwards! This didn’t turn out well for us. We have been using our pressure cooker for a couple of years now and this is our first “fail”. Pressure cooker wouldn’t come to pressure because it needed liquid added. After checking seals etc and digging out the manual we added liquid per to manual’s recommendation. Perhaps because liquid was needed the flavor was so mild that it was missing “something”. We have lots of of leftovers to try to jazz up to eat this week, I guess. Could I use a pork tenderloin for this recipe instead of the shoulder? Hi Corissa – pork tenderloin is quite a bit less fatty so it may be less tender in the end. I just made this recipe with 3lb of pork tenderloin, as it was on sale and I like the cut. I reduced the cooking time to 65min to compensate for having slightly less meat than the recipe calls for, and for using a leaner cut. It turned out perfectly tender and very flavorful. I’ll definitely be making this again. Fantastic recipe! I’m so happy to hear that you liked it Adam! Can I use a pork loin roast? Roast being the key word. Hi Teri – I think that Pork Loin will be too lean to shred. Even if it is a roast. I made this recipe and let me just say it is out standing!! So easy and so delicious I highly highly recommend this recipe! Possibly one of the best dishes I’ve ever made in my life! Thank you for sharing! Oh – I love that SK! Thank you for the feedback! So happy that you loved the recipe! I altered this a bit. I did 2 lbs of pork and I cut the cumin and oregano amounts in half. I probably should have cut the salt back a bit too. I cooked it for 45 minutes in the instant pot, natural pressure released it for 10 minutes, then broiled the meat for 5 minutes on each side. Then put it back in the sauce after it had reduced for during the broiling. It was fantastic. So happy to hear that you liked it Lisa! 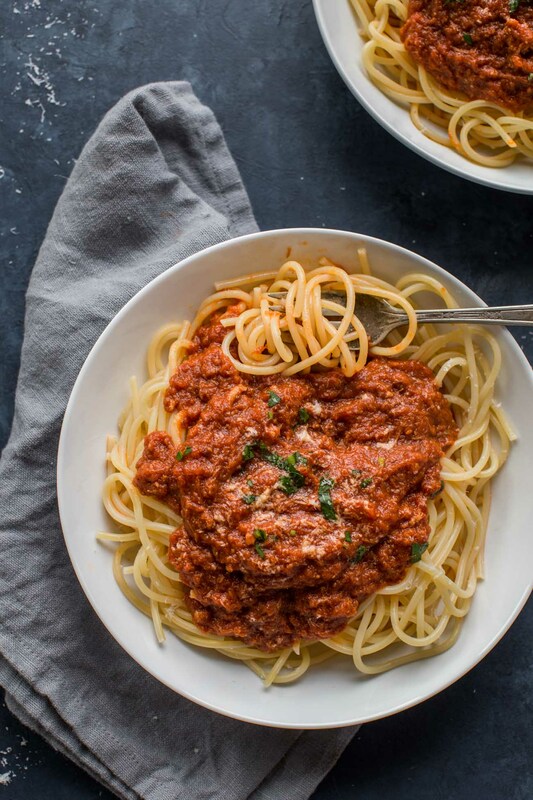 Just tried this and it’s one of the best meals I’ve made in the Instant Pot since we got one a couple of years ago. I would describe it as an incredibly flavorful carnitas-esque treatment of pork with a depth of flavor that is unique. Thanks so much! I’m so happy you liked it Cristina! I made this for a football tailgate, 5 1/2 lb shoulder so I doubled the recipe. Used pickled onions, jalapeños, hot sauce, limes grilled some flour and corn tortillas. They were the best tacos ever! I received so many comments on how how they were the best tacos they ever had. Thank you for this recipe. It will be in my normal rotation of party foods. Of course! I’m so happy to hear that everyone loved them! So so so good. I used my crockpot. I didn’t make any changes at all and it was perfect. Made Pico to go with it and served with lime, avocado, cilantro, and lettuce. This will be thrown into our rotation. Thanks so much for sharing it! I’m so happy you liked it Marianne! This Cuban-American will report back– fingers crossed! You need this in your life. Not only was the great the day we made it, we used leftovers to make a delicious Cuban sandwich. So happy to hear that you liked it Phill! Cubans don’t eat their pork in tacos. That is Mexican. Mexican and Cuban are not the same..